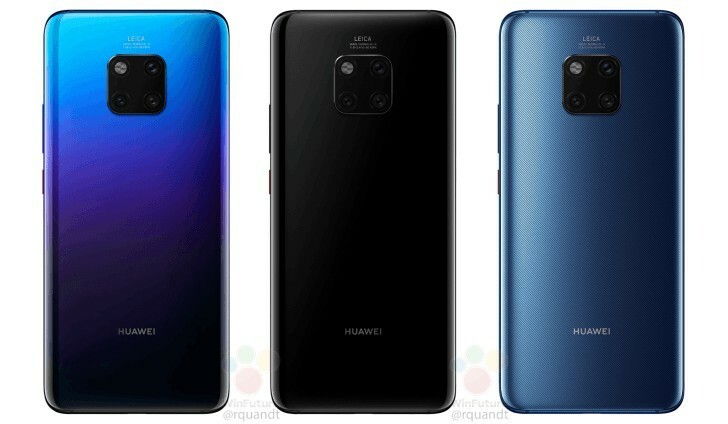 Huawei is preparing a big event in London for the unveiling of its Mate 20 and Mate 20 Prosmartphones (and possibly even a Mate 20X gaming handset) next week. But today a huge leak out of Germany may have spoiled everything that’s going to be presented on stage regarding the Mate 20 Pro. Some new official-looking press renders were leaked too, alongside UK pricing. Let’s start with that. For the version with 6GB of RAM and 128GB of storage, which is the base model, you’ll need to shell out £899. There will be other variants with 8GB of RAM and 256 or 512GB of storage. That’s a £100 price premium compared to the P20 Pro’s price, and a £130 hike coming from the Mate 10 Pro. So it looks like Huawei doesn’t want to ignore one of the most prevailing trends of the past year in the smartphone world – price increases for flagships across the board. You do get quite a lot for your money, though. The Mate 20 Pro will be powered by the Kirin 980 chipset, and it will have a 6.39-inch notched touchscreen with an under-display fingerprint sensor integrated into its bottom half area. The resolution is 1440×3120, matching LG’s G7 ThinQ and V40 ThinQ. Of course there’s a notch up top, which houses a 24 MP selfie camera and an IR laser for face unlocking that’s more secure than your average run of the mill Android implementation. On the back you get three cameras in a 40 MP + 20 MP + 8 MP setup. The main 40 MP sensor has f/1.8 aperture and combines four pixels into one for better quality. The 20 MP cam is a telephoto unit with f/2.4 aperture, and the 8 MP sensor is ultra wide-angle. Together, these cameras will enable 5x optical zoom, as well as ultra macro shots – from a distance of just 2.5cm. Two NPUs will take care of analyzing image content and optimizing settings accordingly, including for low-light pictures. 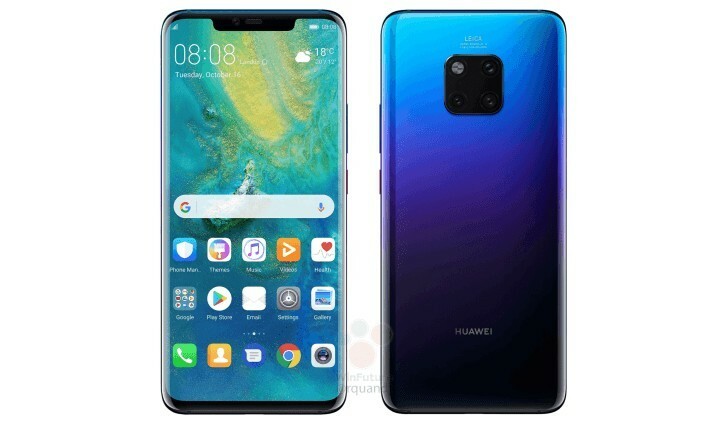 Oddly enough, Huawei will introduce its own Nano Memory Card format with the Mate 20 Pro, which won’t have support for microSD. The Nano cards will be offered in capacities up to 256GB and are the size of a nano SIM (hence the name). They should be as fast as microSD cards, but obviously smaller. The Mate 20 Pro comes with a 4,200 mAh battery that is topped up by a 40W charger, meaning it should go from zero to 70% in just 30 minutes. Additionally, the phone supports wireless charging. What’s more, it can act as the wireless charger for Huawei’s Freebuds 2, also launching at the same event. This reverse wireless charging tech could theoretically be used even to pump some juice into another smartphone that supports wireless charging, but it’s unlikely to be very fast. IP68 water and dust resistance is certified for the Mate 20 Pro, which will weigh 189g and be 8.6mm thick. Connectivity-wise, you’ll get dual-band Wi-Fi, Bluetooth 5.0, NFC, and very fast LTE. The handset will ship running Android 9 Pie with EMUI 9.0 on top. Four colors will be offered: Twilight, black, blue, and green.